Housworth Construction was established in 1929 by Gladis Housworth. 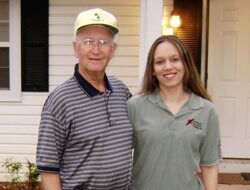 At that time it was a plumbing company, but since then we have grown into a full-service renovation team. We promise to solve all of your problems – we won’t start a project and leave it half-finished for another contractor to solve. The technicians at Housworth Construction are fully trained and dedicated to providing high-quality service 100% of the time. And as an Owens Corning Platinum Preferred Contractor, we have access to leading products and solutions for your roofing and other home exterior needs. Our team will assist you in making decisions for your construction project and will execute every detail to perfection. Many things have come and gone over the past 80 years, but the quality of our service will always remain. Let Housworth Construction help with your exterior remodeling needs and give you the house of your dreams! "Professional and thorough. Helpful and customer-first attitude." Professional and thorough. Helpful and customer-first attitude. "I met Evan and James (I think that was his name, sorry if I got it wrong)..."
"Your Reps (Darren and Eric) are very nice, kind and knowledgeable also..."
Your Reps (Darren and Eric) are very nice, kind and knowledgeable also very very helpful. It was difficult situation with insurance co., but these two gentlemen kept fighting with them and finally we WON and GOT the roof approved. GREAT JOB! Laila Patrick is a dedicated businesswoman with over 15 years of experience operating her own construction and remodeling company. Laila grew up in the construction industry. As a child she lived with her grandfather Jack Patrick, the previous owner of Housworth. Laila would help out in her grandfather’s hardware store or around the job sites, and even at a young age she noticed the unprofessionalism of some of the contractors. She decided that if she ever had the chance, she would build a structured, professional company that could reliably satisfy customers’ needs. When Jack decided to retire, Laila was able to take over the business. She has since transformed Housworth Construction from a small company into the extremely successful business it is today. In 1998 Laila became the first female-owned Owens Corning Platinum Preferred Contractor in the country. Her managerial style and leadership capabilities are the key to Housworth Construction’s success. Laila’s dedication to details and her provision of quality products have earned her and Housworth Construction numerous accolades including Top Platinum Preferred Contractor eight years in a row, Angie’s List Super Service since 2002, and a Triple A+ rating on the BBB. Outside of work, Laila enjoys spending time and playing soccer with her children. She also volunteers in the area. She is driven both inside and outside of work and looks forward to successes to come. Integrity: Our ethics demand we are respectful and honest in our relationships. Positive Attitude: Our positive attitude allows us to create a fun and caring environment, which leads to more productive relationships. Family: We strive to improve the quality of life for ourselves, family and friends and we hold these relationships in the highest regard. Teamwork: We choose to be accountable, to do our jobs correctly and completely, and to go above and beyond to help our fellow team members and customers. Customer Satisfaction: We genuinely care about our customers and strive to exceed their expectations through quality craftsmanship and exceptional customer service.